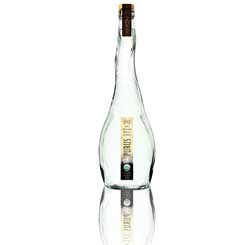 Anheuser-Busch Cos. is going "high style" and launching a premium brand of organic vodka called Purus. The company is selling each bottle at $35 a pop, and is planning on selling it at exclusive bars, restaurants and lounges in the Northeast. The spirit comes in an elegant raindrop shaped clear bottle evoking a simple clean modern aesthetic. But its the contents on the inside that are the real draw; made of pristine water from the Italian Alps and organic wheat. The 80 proof vodka is set to attract "the modern luxury connoisseur, of the conscious set." in 2005. This initiative resulted in the formation of a subsidiary to develop and market other liquors. Chief Executive August Busch IV has said that the company must consider drinks beyond beer to win back consumers. Vodka clearly making the short list of spirits on the production line, as it is the fastest-growing spirit in the U.S. last year, with an 11 percent gain, to $4 billion, according to the Distilled Spirits Council of the United States. The company is looking to have Purus become the leading brand in luxury vodka market, by combining strict organic practices and paramount attention to the high end palate, and sensibility.